Noncoding RNAs perform diverse regulatory functions in living cells. In plants, two RNA polymerase II-related enzymes, RNA polymerases IV and V (Pol IV and V), specialize in the synthesis of noncoding RNAs that silence a subset of transposable elements and genes via RNA-directed DNA methylation (RdDM). In this process, Pol IV partners with RNA-dependent RNA polymerase 2 (RDR2) to produce double-stranded RNAs that are then cut by an RNase III enzyme, Dicer-like 3 (DCL3), into 24 nt small interfering RNAs (siRNAs). The siRNAs are loaded into an Argonaute family protein, primarily AGO4, and guide the complex to complementary DNA target sequences where RdDM and repressive chromatin modifications ensue. The dependence of 24 nt siRNA biogenesis on Pol IV and RDR2 has been known for more than a decade, but the elusive pre-siRNA transcripts synthesized by Pol IV and RDR2 have only recently been identified. 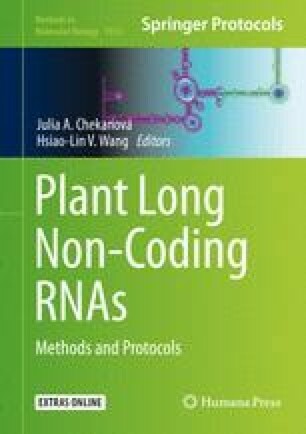 This chapter describes the approaches that enabled our identification of Pol IV/RDR2-dependent RNAs (P4R2 RNAs) in Arabidopsis thaliana. These included the use of a triple Dicer mutant (dcl2 dcl3 dcl4) to cause P4R2 RNAs to accumulate, genome-wide identification and mapping of P4R2 RNAs using a modified Illumina small RNA-Seq protocol, and multiple bioinformatic pipelines for data analysis and displaying results. The authors thank Doug Rusch and Haixu Tang for helping guide the informatics analyses, as well as Ross Cocklin for generating the rdr2 dcl2/3/4 quadruple mutant. C.S.P. is an Investigator at the Howard Hughes Medical Institute (HHMI) and former Plant Investigator of the Gordon and Betty Moore Foundation (GBMF). This work was supported by the National Institutes of Health (NIH) Grant GM077590, GBMF Grant GBMF3036 (to C.S.P. ), and Investigator support funding of C.S.P. from HHMI. T.B. was supported, in part, by an NIH Ruth L. Kirschstein National Research Service Award. T.B. is currently supported by the LabEx consortium ANR-10-LABX-0036_NETRNA (“Investissements d’Avenir”) and by the French Agence Nationale de la Recherche (ANR) Grant ANR-17-CE20-0004-01.